We chose this story of a Nigerian woman on International Women’s Day who made history becoming the first female pilot in Nigeria, to inspire girls and women all over the world. Captain Chinyere Kalu, born 1970, is the first female pilot in Nigeria. Capt. Chinyere grew up in a supportive extended family. Her decision to start a career in Aviation was spurred by her adventurous aunt, who was well known for travelling overseas within their hometown. As the matriarch of the household, her aunt approved of her decision and then she began her journey into aviation. She schooled in Anglican Girls Grammar School, Yaba, Lagos and then trained as a Private and Commercial Pilot, SP.12 Batch, NCAT, Zaria (1978). She took several aviation courses in UK, USA, and Zaria. She wanted to have the opportunity to travel round in the world and keep an adventurous lifestyle. So she took up the male dominated and challenging career and became the first female pilot in Nigeria. She’s married to Mr. Okoli Kali with children. 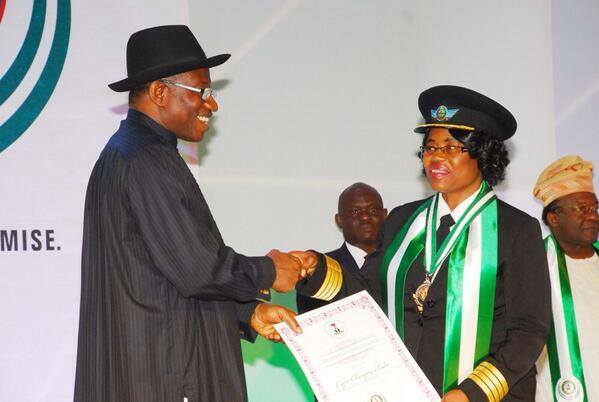 In 2011, President Goodluck Jonathan appointed her as the Rector and Chief Executive of Nigerian College of Aviation Technology (NCAT) (formerly Nigerian Civil Aviation Training Center)- which is the largest aviation training institute in Africa. Prior to that, she was the Head of the College’s Flying School where she served as an contractual instructor. Without a doubt, Captain Kalu has made her mark as one of the leading lights of the Nigerian aviation industry, creating several industry benchmarks as she moved up the pole and establish herself as a worthy role model for the mass of the Nigerian youth, especially the female child. Captain Kalu began her career with a record-breaking achievement as Nigeria’s first female pilot when, in 1978, she obtained her private pilot license from the nation’s premier aviation college. She had, before this, attended the prestigious Leadership and Citizen Course (SS88) Sea School, Lagos in 1973. burning with passion for excellence and self development, Kalu, who is a member of the African Women Leaders Think Tank Group, has over the years, undergone so many leadership training programmes at home and abroad. Her contribution to the development of the country has not gone unnoticed and has earned her numerous awards, amongst which are: Member of the Federal Republic of Nigeria (MFR) 2006; Member, Nigerian Women Achievers HALL OF FAME; African International Achievers’ Merit Award 2007; Rare Gems Professional Achievements Award 2007; Member, Nigeria’s 50 Greatest Women of Democratic Administration of Ghana 2012.